Cannabis and Snoop Dogg go hand in hand. And since the legalization of weed is becoming a respected initiative, and the medical-marijuana industry is on the up-and-up, it makes sense that the rapper was tapped by a Canadian cannabis company to promote its products. Snoop's company, LBC Holdings, inked a deal with the cannabis company Tweed to use Snoop's content and brands, the Huffington Post reports. 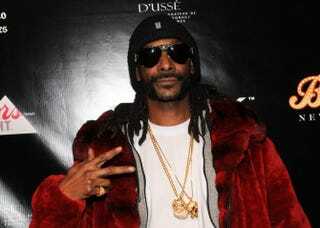 Snoop will be compensated monetarily and with stock in the company. "There are real social and medical benefits from the cannabis industry, and the world is seeing this positivity in a whole new way," Snoop Dogg said in a press statement. "Canada has been at the forefront of the business model, and I look forward to being a part of the road ahead." Snoop already has a line of cannabis called Leafs by Snoop and created a venture capital fund called Casa Verde Capital that specifically invests in cannabis-related businesses. Tweed's president, Mark Zekulin, made note of Snoop's clout in the cannabis industry, too. "The deal locks us in a relationship with a connoisseur and icon in the cannabis space,'' Zekulin said Thursday.